ENVIROPAK CORPORATION (“EnviroPAK”) owns and maintains the website located at www.EnviroPAK.com (the “Site”). PLEASE READ THE FOLLOWING TERMS AND CONDITIONS OF USE (this “Agreement”) CAREFULLY BEFORE USING THE SITE. This Agreement sets forth the legally binding terms and conditions for using the Site and all services provided on the Site. By using the Site in any manner, you agree to be bound by the Terms and Conditions of this Agreement, including any additional terms, conditions, and policies available on the Site, and all applicable law. If you do not agree to this Agreement, do not use the Site. EnviroPAK reserves the right to change this Agreement at any time. ENVIROPAK AND/OR ITS SUPPLIERS MAKE NO REPRESENTATIONS ABOUT THE SUITABILITY, RELIABILITY, AVAILABILITY, TIMELINESS, AND/OR ACCURACY OF THE INFORMATION, PRODUCTS, SERVICES AND RELATED GRAPHICS (COLLECTIVELY, THE “INFORMATION”) CONTAINED ON THE ENVIROPAK CORPORATION WEB SITE FOR ANY PURPOSE. TO THE MAXIMUM EXTENT PERMITTED BY APPLICABLE LAW, ALL SUCH INFORMATION IS PROVIDED “AS IS” WITHOUT WARRANTY OR REPRESENTATION OF ANY KIND, EXPRESS OR IMPLIED. ENVIROPAK AND/OR ITS SUPPLIERS HEREBY DISCLAIM ALL WARRANTIES AND REPRESENTATIONS WITH REGARD TO THIS INFORMATION, INCLUDING ALL IMPLIED WARRANTIES OF MERCHANTABILITY, FITNESS FOR A PARTICULAR PURPOSE, TITLE AND NON-INFRINGEMENT. NO ADVICE OR INFORMATION (ORAL OR WRITTEN) OBTAINED BY YOU FROM ENVIROPAK SHALL CREATE ANY WARRANTY. You may choose to use forms or to opt into emails from EnviroPAK or its staff that are associated with the Site. You may unsubscribe at any time by clicking on the “unsubscribe” link at the bottom of any email sent. The entire content included in the Site, including but not limited to text, images, video, graphics, and code is proprietary and, in addition to EnviroPAK’s federally registered copyrights, subject to the protection of the US Copyright Act and other applicable law. Permission is granted to electronically copy and print hard copy portions of this site for the sole purpose of individual use. Any other use, including but not limited to the reproduction, distribution, display, or transmission of the content of the Site is strictly prohibited, unless otherwise authorized in writing by EnviroPAK. You further agree not to change or delete any proprietary notices from materials downloaded from this site. EnviroPAK® and other EnviroPAK trademarks, graphics, logos, designs, page headers, button icons, scripts, and service names are federally registered trademarks, common law and/or state trademarks, or trade dress of EnviroPAK. EnviroPAK’s trademarks and trade dress may not be used, including as part of trademarks and/or as part of domain names or email addresses, in connection with any product or service in any manner that is likely to cause confusion as to the source, origin, or affiliation of said products or services. This Agreement is applicable to you upon your accessing the Site and/or completing any forms or providing any information. The Agreement, or any part of it, may be terminated by EnviroPAK without notice at any time, for any reason. The provisions relation to Copyrights, Trademark, Disclaimer of Warranties, Limitation of Liability, Indemnification and Miscellaneous shall survive any termination. EnviroPAK may deliver notice to you by email, a general notice on the site or by other reliable means to the address you have provided to EnviroPAK. Except as explicitly stated otherwise, any notices to EnviroPAK shall be given by postal mail to EnviroPAK Corporation; ATTN: Legal Notices; 4302 Shoreline Drive, Earth City, MO 63045. Notice shall be deemed given three days after the date of mailing or, in the case of email, 24 hours after email is sent. Your use of this Site shall be governed in all respects by the laws of the State of Missouri, U.S.A., without regard to choice of law provisions. You agree that jurisdiction over and venue in any legal proceeding directly or indirectly arising out of or relation to this site shall be in the state or federal courts located in St. Louis County, Missouri. Any cause of action or claim you may have with respect to the site must be commenced within one year after the claim or cause of action arises. EnviroPAK’s failure to insist upon or enforce strict performance of any provision of this Agreement shall not be construed as a waiver of any provision or right. If any provision of this Agreement is held to be unenforceable, then such provision will be modified to reflect the parties’ intention and all remaining provisions of this Agreement shall remain in full force and effect. Neither course of conduct between the parties nor trade practices shall act to modify any of these terms and conditions. EnviroPAK may assign its rights and duties under this Agreement to any party at any time without notice to you. Harassment in any manner or form on the site, including via e-mail, chat, or by use of obscene or abusive language is strictly forbidden. Impersonation of others, including a EnviroPAK or other licensed employee, host or representative, as well as other member or visitors to the Site is prohibited. You may not upload to, distribute, or otherwise publish through the Site any content which is libelous, defamatory, obscene, threatening, invasive of privacy or publicity rights, abusive, illegal or otherwise objectionable which may constitute or encourage a criminal offense, violate the rights of any party or which may otherwise give rise to liability or violate any law. You may not upload commercial content on the Site or use the Site to solicit others to join or become members of any commercial online service or organization. EnviroPAK does not and cannot review all communications materials that may be posted to or created by users accessing the Site, and is not in any manner responsible for the content of these communications and materials. You acknowledge that by providing you with the ability to view and distribute user-generated content on the site, EnviroPAK is merely acting as a passive conduit for such distribution and is not undertaking any obligation or liability relating to any contents or activities on the Site. You agree not to post any content which may be found to infringe upon any third party’s copyright, trademark, patent, trade secret, or other proprietary or intellectual property right(s). Users agree to notify EnviroPAK of any potentially infringing content. EnviroPAK reserves the right to block or remove communications or materials that it determines to be (a) abusive, defamatory or obscene; (b) fraudulent, deceptive or misleading; (c) in violation of a copyright, trademark or other intellectual property right of another or (d) offensive or otherwise unacceptable to EnviroPAK in its sole discretion. By posting content to the Site, it may be possible for an outside website or third party to re-post that content. You agree to hold EnviroPAK harmless for any dispute concerning such use by third parties. 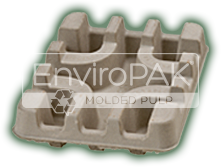 EnviroPAK considers any unsolicited suggestions, ideas, proposals, or other material submitted to it by users (“Material”) to be non-confidential and non-proprietary, and EnviroPAK shall not be liable for the disclosure or use of such Material. Any communication by you to EnviroPAK is subject to this Agreement. You hereby grant and agree to grant EnviroPAK a worldwide, non-exclusive, perpetual, irrevocable, royalty-free, fully-paid, sublicensable and transferable right and license to incorporate, use, publish, and exploit such Material for any purpose whatsoever, commercial or otherwise, without compensation or accounting to you and without further recourse by you. You agree to indemnify, defend and hold harmless EnviroPAK, its officers, directors, employees, agents, licensors and suppliers from and against all losses, expenses, damages and costs including reasonable attorneys’ fees, made by any third party due to or arising out of your breach of this Agreement or other EnviroPak policy documents, or your violation of any law or the rights of a third party, or any activity related to your use of this Site, including negligent and wrongful conduct, by you. In an attempt to provide increased value to our Site visitors, EnviroPAK may link to sites operated by third parties. However, even if the third party is affiliated with EnviroPAK, EnviroPAK has no control over these linked sites, all of which have separate privacy and data collection practices, independent of EnviroPAK. These linked sites are only for your convenience and therefor you access them at your own risk. You agree that EnviroPAK shall not be responsible or liable, directly or indirectly, for any damage or loss caused or alleged to be caused by or in connection with the use of or reliance on any such content, goods, or services available on or through any such third party websites or resources. Nonetheless, EnviroPAK seeks to protect the integrity of its web site and the links placed upon it and therefore accepts any feedback on not only its own Site but for sites it links to as well. EnviroPAK does not guarantee continuous, uninterrupted access to the Site, and operation of the Site may be interfered with by numerous factors outside EnviroPAK’s control. You agree that you will not: (i) Take any action that imposes or may impose an unreasonable or disproportionately large load on EnviroPAK’s infrastructure; (ii) copy, reproduce, modify, create derivative works from, distribute, or publicly display any user content without the express written consent of EnviroPAK or that user, as applicable; (iii) interfere or attempt to interfere with the proper working of the Site or any activities conducted on the Site; or (iv) bypass any measures EnviroPAK may use to prevent or restrict access to the Site. The services hereunder are offered by EnviroPAK Corporation, located at 4203 Shoreline Drive, Earth City, MO 63045.